SUBHEAD: Too little, too late. No longer are we faced with prevention so much as mitigation and management. Image above: In original article. 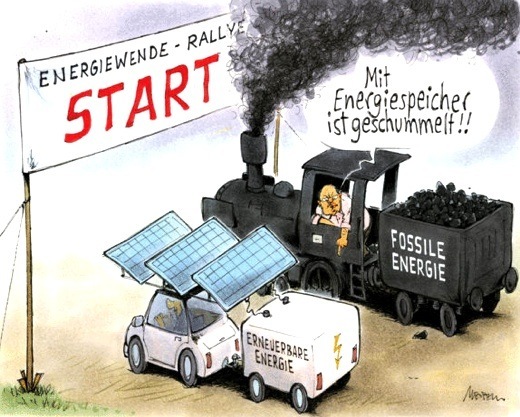 Cartoon by Gerhard Mester (2013) showing a race between renewable energy and fossil fuels. Speach bubble translation from German says "You are cheating by using an energy storage device". As if coal were not just a dirtier battery. From (https://commons.wikimedia.org/wiki/File:Energiewende-Rallye-Stromspeicher-Gerhard-Mester.gif). The group was astonished when I related the actual figure: 1.5 percent. The figure comes from the Paris-based International Energy Agency, a consortium of 30 countries that monitors energy developments worldwide. The audience that evening had been under the gravely mistaken impression that human society was much further along in its transition to renewable energy. Even the pessimist in the audience was off by more than a factor of four. The category “Biofuels and waste,” which makes up 9.7 percent of the world total, includes small slivers of what we Americans call biofuels (ethanol and biodiesel), I said, but mostly represents the deforestation of the planet through the use of wood for daily fuel in many poor countries, hardly a sustainable practice that warrants vast expansion. This percentage has been roughly the same since 1973 though the absolute consumption has more than doubled as population has climbed sharply. The burden for renewable energy expansion, I concluded, would therefore remain on the six categories I mentioned at the outset of my presentation. In my presentation I had explained to my listeners that renewable energy is not currently displacing fossil fuel capacity, but rather supplementing it. In fact, I related, the U.S. government’s own Department of Energy with no sense of alarm whatsoever projects that world fossil fuel consumption will actually rise through 2050. This would represent a climate catastrophe, I told my audience, and cannot be allowed to happen. Few people alive today were alive back then. A somewhat larger group has parents who lived through World War II and so have some inkling of what such a mobilization would involve. It’s hard enough to imagine this group agreeing that their household consumption should be curtailed significantly for decades (through taxes, higher prices and perhaps even rationing) to make way for huge societal investments in vast new wind and solar deployments; electricity storage for all that renewable electricity; mass transit; deep energy retrofits for buildings; energy-efficient vehicles; and even revised diets that are less meat-intensive and thereby less energy-intensive. Even harder to image is the much larger group with a more tenuous or nonexistent connection to the World War II experience embracing such a path. The trouble with waiting, of course, is that climate change does not wait for us, and also that it shows up with multi-decadal lags. The effects of greenhouse gases emitted decades ago are only now registering on the world’s thermometers. That means that when climate conditions finally become so destructive as to move the public and the politicians to do something big enough to make a difference, it will likely be too late to avoid catastrophic climate change. But since each increment of temperature rise will inflict more damage, the scientist says, we would be wise to seek to limit temperature rise as much as we are able (even though the odds are now overwhelmingly against staying below a 2 degree rise). No longer are we faced with prevention so much as mitigation and management. That’s still something, and it provides a way forward that doesn’t rely on an increasingly unrealistic goal.